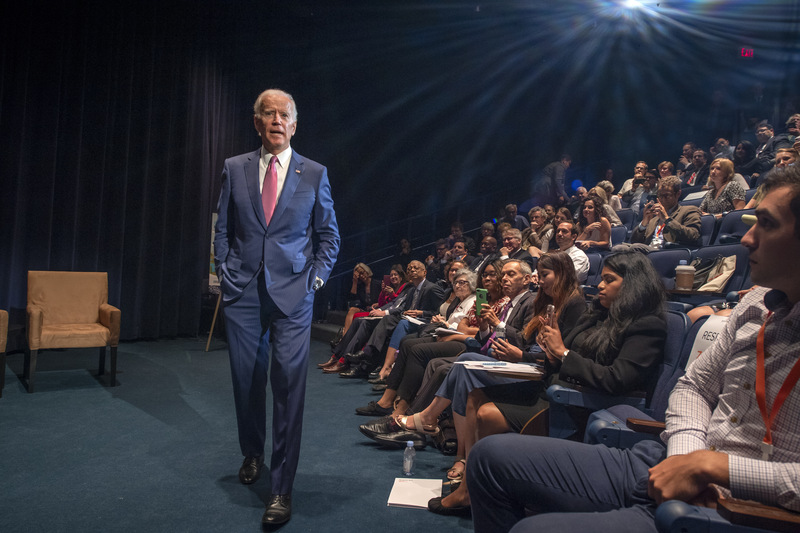 On September 13, experts and elected officials gathered in Washington, D.C. to tackle the issues of long-term stagnating wages, income inequality, and the generally low wages facing the American economy. Mark Zuckerman, president of The Century Foundation (TCF), welcomed 150+ guests to “Building a High Wage America: Lessons from the Heartland,” co-hosted by TCF’s Bernard L. Schwartz Rediscovering Government Initiative and the Economic Policy Institute (EPI), with additional support from Heartland Capital Strategies, the AFL-CIO Industrial Union Council, the Joyce Foundation, and PNC Bank. Here are the key points made by experts representing the Century Foundation’s tour of the heartland, alongside insights from experts in national policy, all in the interest of raising wages across our economy. 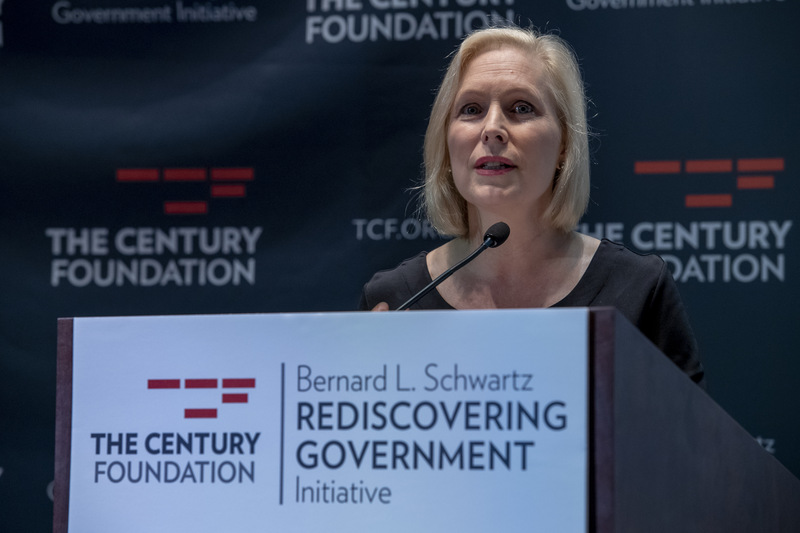 New York senator Kirsten Gillibrand led off the event underscoring the importance of building a high wage economy in America: “Too many workers in our country are underpaid. Too many workers aren’t earning enough to take care of their kids, to put some money aside to be able to have a vacation, to be able to take time off when, God forbid, someone in their family is injured or sick.” Gillibrand was followed by two panels, focusing on the nation’s heartland and national economic trends, respectively, before former vice president Biden’s closing exposition on the state of the working class. “We can and we must do better,” Thea Lee, president of EPI, asserted in the first panel. One area of economic policy that has been particularly neglected is trade, which impacts the nation’s heartland—its workers, businesses, and communities—the most. Trump has “correctly identified a vacuum” in this policy area, she says, but instead of tariffs, we need a coordinated strategy that includes addressing the currency misalignment that has long favored the financial sector over U.S. business and workers. Trade deals also need to be fair, and that means accounting for impacts on workers nationally and internationally, and setting multilateral standards for both wages and the environment. However, as Andrew Stettner noted, trade policy is a necessary but not sufficient condition for revitalizing America’s manufacturing communities. He and Joel Yudken released a federal policy report at the conference that charts the path to a fair and sustainable manufacturing sector. The report is a culmination of three regional events hosted by The Century Foundation, to bring together leaders in business, labor, community groups, and government, to hear what works and what needs to be done to secure good-paying jobs in the heartland. Policies highlighted include increasing the number of Manufacturing USA institutes, loans for small businesses, and bringing workforce training in line with the needs of new manufacturing jobs—which means improving industry partnerships with community colleges, and funding more apprenticeships. Another way to create advanced manufacturing jobs is through green technology. David Wilhelm, CEO of Hecate Energy, who is helping build the largest solar farm in the United States in southern Ohio, suggested using land in urban and rural areas across the country for renewable energy projects that create good manufacturing jobs. Wilhelm also suggests alternative forms of ownership—cooperatives and worker-owned businesses—as a path to better wages. Steve Herzenberg, director of Keystone Research Center in Pittsburgh, points out that the amount of corporate welfare given out in the state-based race to the bottom is, at times, “nothing short of malpractice.” Twenty-three rural counties in Pennsylvania don’t even have a community college, while the state has engaged in the race to the bottom by giving out massive tax breaks to big corporations. Public funds should instead work to facilitate partnerships to connect labor and business, and connect manufacturers who face similar technological challenges, Herzenberg suggested. The nation is sorely in need of both a sustainable manufacturing strategy and a plan to address decades-long wage stagnation and poor working conditions across the sectoral spectrum. To raise wages more broadly across the economy, experts in the second panel spoke about the need for full employment, stronger unions, and better labor standards. Josh Bivens, research director at EPI, offered three core reasons behind the need for monetary and fiscal policy to target full employment. “It’s easy to do,” Bivens said, because it’s all about there being enough spending in the economy. When spending is low, government can spend on things like infrastructure. “It’s better than free,” he added, because unemployment is pure wasted potential. Lastly, truly full employment boosts wages, especially for the lowest wage earners and those most vulnerable to job loss, because it gives workers power via the threat of finding another job if their current one doesn’t pay. Americans across sectors have felt the impact of the rise of corporate power and the decline of worker power. Eileen Appelbaum, co-director at CEPR and expert on inter-firm relations, examined how the fissuring of work, or increasing reliance on contract firms to provide previously in-house services such as IT, HR, and catering, affects wages and work. Dominant firms have monopsony power because they are able to bid down the price for these services while contracted firms need to cut costs to win bids, putting downward pressure on employment and wages. To counter this form of wage suppression, Appelbaum suggested, we need joint employer standards. Especially relevant in the service sector, joint employer standards provide the ability for franchise workers to organize across different locations, to collectively fight for standards such as medical care, paid sick and family leave, and vacation. This upward distribution of power has also been written into law since the time of the New Deal, Sanjukta Paul, assistant professor of law, stated in her remarks. Rights to coordinate have been given, by law, to those in power to protect ownership, while rights to coordinate, for example through unions, have been stripped from workers and regular people. The idea of competition has been promoted as the holy grail, diminishing and neglecting the fact that coordination exists at all levels of society. More broadly, Paul suggests, we have to realize and support coordination not only for companies but for workers. More specifically, in specific cases like Uber, drivers should be allowed to set prices, and to unionize. “There’s no one silver bullet to gaining worker power,” summarized Bill Spriggs, chief economist at the AFL-CIO. But citing state-based research that shows higher levels of investment in education, Temporary Assistance for Needy Families, and lower rates of incarceration, Spriggs added, unions are an antidote to downward wage pressure. “Workers must come in the job in a union as a right, not a fight,” Spriggs urged. Workers should enter a job voting on which union to be in, rather than whether or not to be in one. Further, in terms of practical steps, Spriggs suggested that the next administration should commit to working with economists who actually believe in worker power. This enthusiasm was captured in reporting, from Salon to Politico, and on the radio across the country, from Detroit’s ABC affiliate to Atlanta’s Fox affiliate. Furthermore, the federal policy agenda crafted throughout TCF’s heartland tour will be presented at this week’s House Energy and Commerce Committees hearing, “Built in America: Jobs and Growth in the Manufacturing Sector.” Stay tuned.